This week we celebrate our favorite Spring Holidays with festive menu ideas and tasty treats to share with family and friends. Check out these recipes, straight from Fun & Simple Gourmet, for a casually festive Easter feast and be sure to read to the end of the blog where Guest Blogger, Cheryl Conklin, MSEd, from Wellness Central, tells us “How to Feel Better After Overindulgence with a Little Self-Care.” Complete with tips and recommendations to help alleviate the symptoms of overindulging before, during and after a festive holiday celebration. Wishing you all a most Happy Easter and Happy Passover Week! Spring is a time of rebirth and renewal. A time to celebrate Easter and Passover with fresh spring flowers, spring vegetables and eggs! Yes, eggs are used to celebrate both Easter and Passover. Easter eggs are common gifts during Eastertide, whether boiled and dyed or chocolate filled with an array of confections, eggs in general are a symbol of rebirth. Easter eggs symbolize the empty tomb of Jesus. Hard boiled or roasted eggs are also very symbolic on the Passover Seder Plate, symbolizing the temple sacrifice and the continuing cycle of life. They are eaten during the Seder Meal, dipped in salt water. My Jeff wants his eggs, deviled…go figure right! And trust me, he can eat an entire dozen, I literally have to hide them so he won’t totally overindulge and eat them all before the guests arrive! Spice up your Spring Holiday Brunch with these festive drinks. Sparkling Cider makes a great non-alcoholic version. 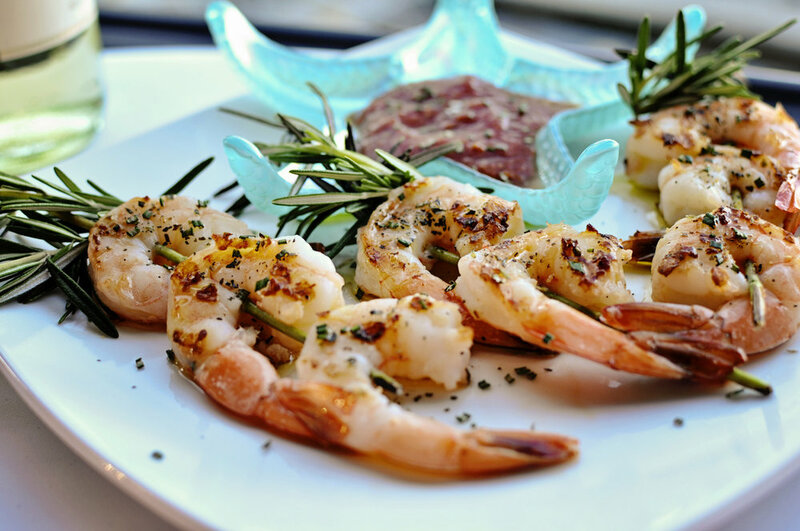 The garnishes of aromatic herbs add a wonderful fresh aroma and flavor. The Venetian~ Fill a champagne flute half way with Prosecco. Add one jigger Campari and a splash of soda water. Garnish with a sprig of fresh thyme. 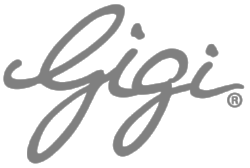 Gigi Bellini~ Fill a champagne flute 3/4 full with your favorite champagne. 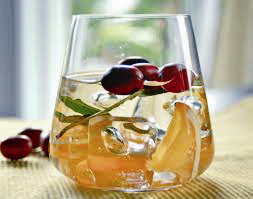 Add a drizzle of Grand Marnier (orange liqueur) to taste and garnish with a fresh rosemary stalk. Pink Lady~ Fill a champagne flute 1/2 - 3/4 full with your favorite champagne. Add freshly squeezed pink grapefruit juice. 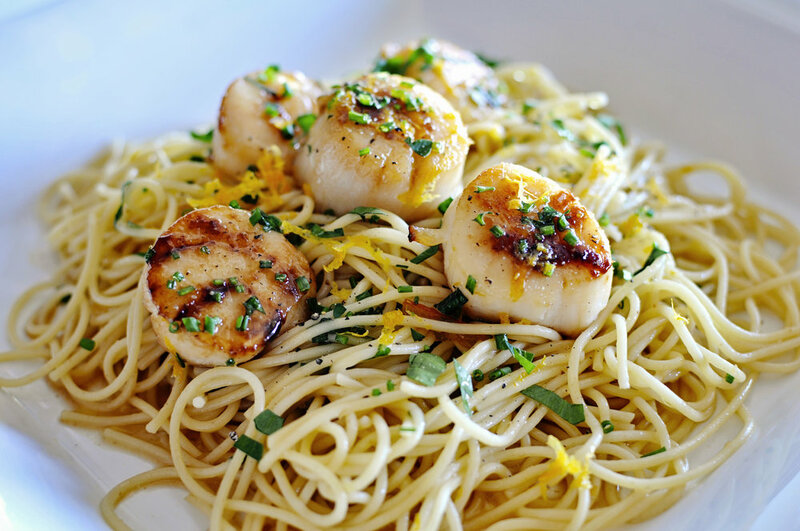 Top with a pinch of fresh lemon zest and garnish with a sprig of fresh thyme. Now, about those eggs! Jeff is crazy for deviled eggs. So simple to prepare, this basic traditional recipe comes from my grandmother. All I have to do is hide them from Jeff until everyone arrives! Place eggs a large saucepan with enough water to cover the eggs and a generous pinch of kosher salt. Bring to a boil over high heat and cook for 8 minutes. Remove from heat and cover, allowing the eggs to rest for 20-25 minutes. Rinse with cold water and carefully crack and peel eggs. 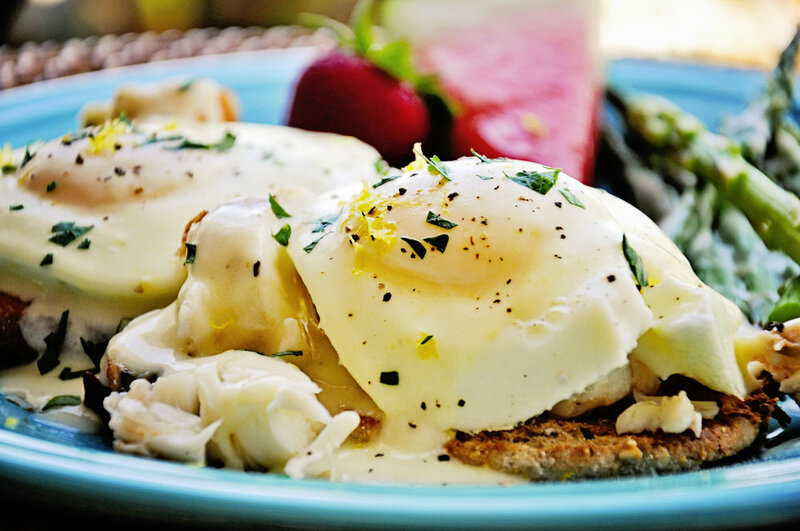 Slice in half lengthwise with a smooth bladed knife and place the yolks in a medium bowl, whites on a serving plate. Smash the yolks with the beaters on an electric mixer and add mayo, mustards and pickle juice. Beat with electric mixer on medium speed until well combined and creamy. Season to taste with salt and pepper and thoroughly combine. Spoon creamy yolk mixture into a pastry bag or a Ziploc baggie, pressing the mixture into one corner. Snip the corner of the Ziploc baggie with a pair of kitchen shears and fill each egg white half with the yolk mixture, 1-2 teaspoons of filling in each one. Sprinkle with paprika and finely chopped chives if desired. Panettone French Toast is my favorite holiday brunch dish. 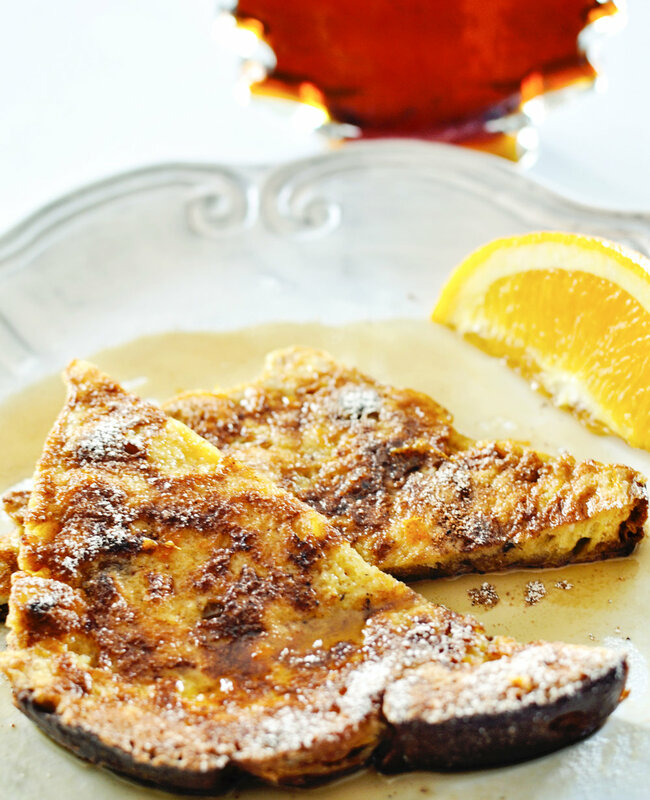 Its’ sweet and savory, served with 100% pure organic maple syrup with a little orange liqueur to bring out the orange flavor in the french toast, always an Easter Brunch crowd pleaser. 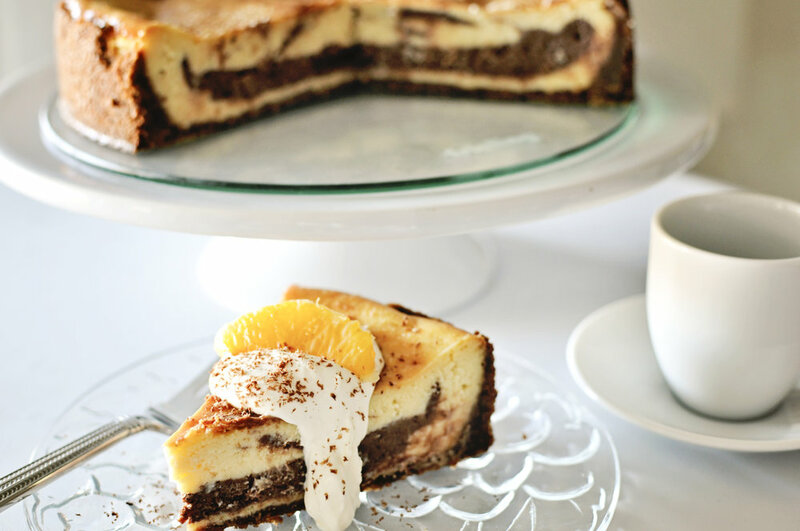 For the rest of our casual Easter feast recipes, simply click on the photos! 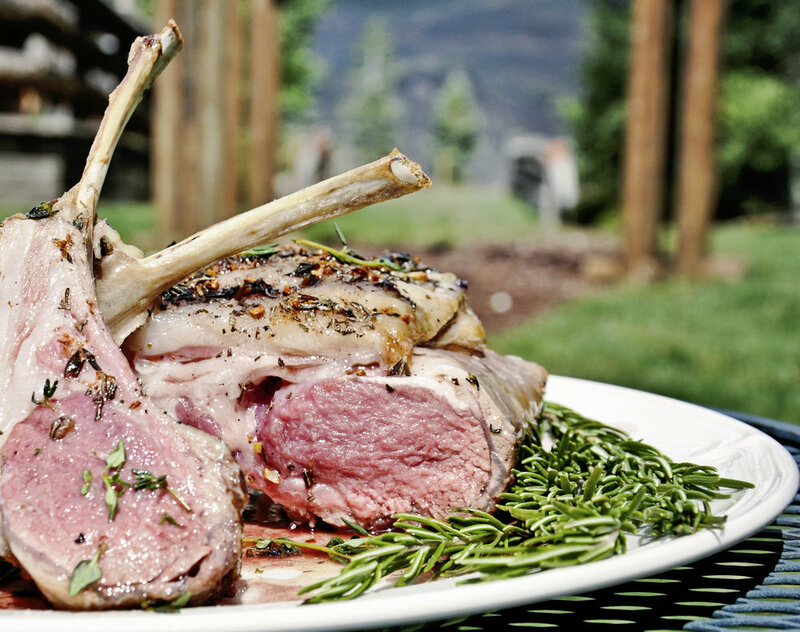 Lamb is a traditional Easter dish and this Colorado Rack with lemon, garlic and fresh herbs is tender and succulent, finished with a lovely red wine sauce. So elegant yet super simple to prepare. The Penne with Spring Vegetables, sugar snap peas, asparagus, scallions, carrots and Brussels sprouts, is fresh and light with a lemony and aromatic cilantro and basil pesto sauce, a perfect compliment to the flavors of the lamb. I included my Mediterranean Potato Salad, also a great side dish with lamb. I always like a fish option on a holiday table and this year it’s my Grilled Citrus Salmon, with a sweet orange and rosemary glaze. For dessert, the Dark Chocolate Swirl Cheesecake, and a Pear & Ginger Crumble topped with vanilla bean ice cream and toasted slivered almonds. 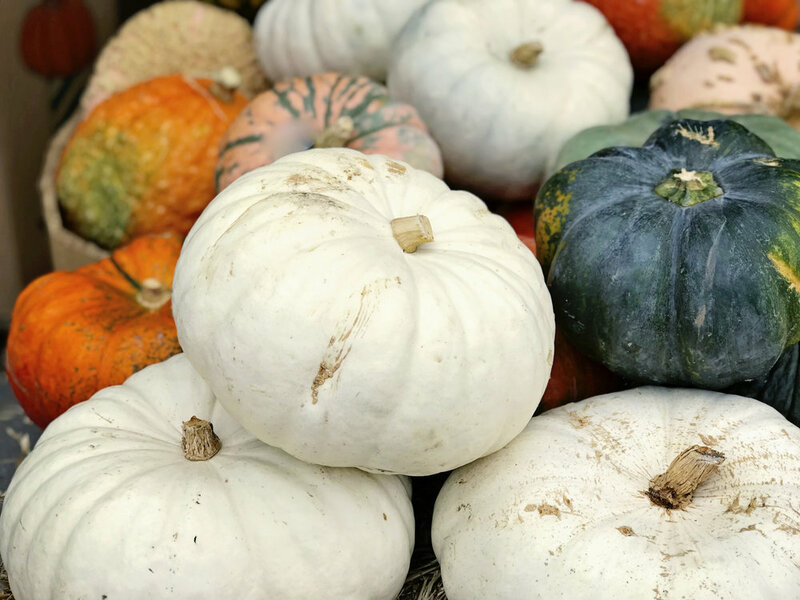 Now, after this wonderful holiday feast you will want to read on with Cheryl Conklin from Wellness Central on how to feel your best! I know you will learn so much from her article, all super great advice! Thanks Cheryl! On special occasions and during big events, many people will unconsciously overdo it when it comes to eating and drinking, which can leave you feeling bloated and unmotivated. Fortunately, there are many things you can do to ease the discomfort that can come with taking on too much, both before and after you indulge. Preventative care is half the battle, especially if you know that certain foods are likely to give you heartburn or indigestion. You can also look for help from a daily probiotic, which will help with tummy troubles and keep you feeling great. Keep reading for tips on how to alleviate the symptoms of overindulgence. Everyone has gas, but when it builds up too quickly without a release, it can cause a great deal of pain and can even mimic the feeling of a heart attack. It can also lead to lots of uncomfortable bloating, leaving you feeling overly full no matter what you eat. Take care to eat slowly (eating quickly can cause gas build-up) by chewing your food slowly and waiting 20 minutes or more before going back for seconds. Not only will this keep you from feeling bloated, but it will also allow you to savor your food and may help prevent weight gain, since taking your time will let you process the feeling that you’re full and satiated. Probiotics can also help a great deal by introducing healthy bacteria into your intestines, boosting your metabolism, and breaking down bits of food left in your digestive tract that can cause problems later. Believe it or not, taking up a hobby can relieve stress and anxiety, as well as provide us with a little comfort when we’re feeling under the weather — and that includes making us feel better after overindulging. Focus on something you enjoy that also brings you comfort, whether that’s settling in for a good movie, reading that book you’ve been meaning to finish, or tackling an art project that’s been lingering in the back of your mind. At the end of the day, doing something enjoyable and healthy makes you feel good, so use that to your advantage. While it’s probably true that the last thing you’ll feel like doing once you’ve overindulged, light activity can actually help you feel better when you’ve overeaten or when you feel bloated. You don’t have to do a full workout; a short walk at a steady pace will help quite a bit, especially if you have trapped gas that’s making you feel miserable. Thanks again Cheryl for your collaboration this week! Wishing everyone a super fantastic & delicious Spring Holiday Week! You can find all of these recipes and many more of my favorites in Fun & Simple Gourmet, at iTunes for your iPad and other Apple devices. If you prefer hardback, it’s available at Amazon & here on my website. When I was asked to work with Foodiechats and the Georgia Peanut Commission again this year to help introduce a fabulous new Elmhurst 1925 plant-based beverage, I was excited and I knew exactly what I wanted to create. Most of you know, I am a pancake girl, but most pancakes are lacking protein. Not these delicious varieties, made with Elmhurst 1925 Vanilla and Chocolate Protein Shakes, the cleanest shake on the planet! This plant-based protein shake is an amazing product on its own, in a smoothie, and fabulous in my super healthy pancakes. So Shake It Up! So, I got in my kitchen and started experimenting. I must have had 10 mixing bowls, and ingredients scattered everywhere, experimenting with different combinations of textures and flavors, and these were our favorites. You don’t have to give up protein to enjoy delicious and healthy breakfast pancakes. 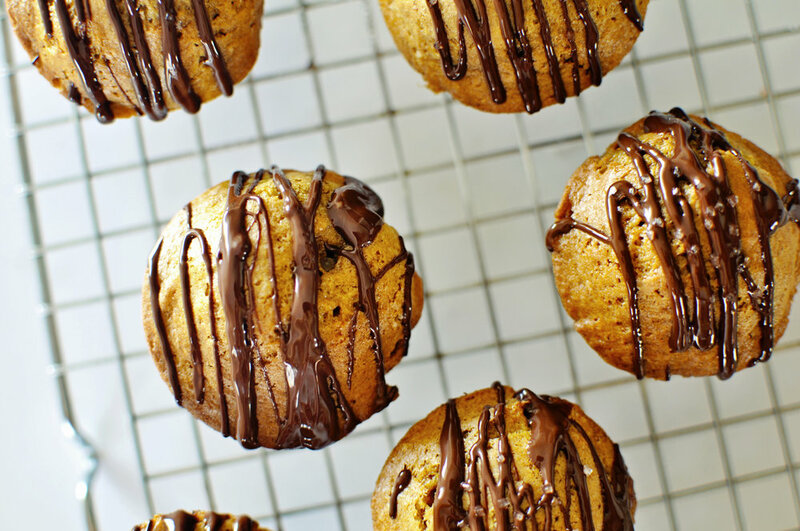 Who doesn’t love chocolate and banana anything? These delicious chocolate pancakes have everything you need to get through the day and make a super yummy breakfast treat or dessert! 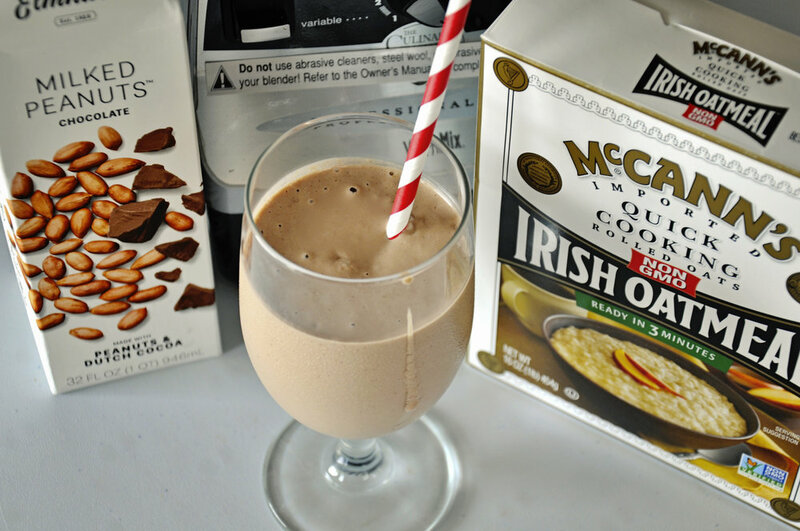 If you are a mocha lover, substitute vanilla with strong coffee or espresso. Whisk dry ingredients in a medium bowl until well combined. Set aside. In a food processor or blender, add banana, egg, Elmhurst 1925 Chocolate Protein Shake, and vanilla (and maple syrup if substituting for sugar). Pulse until creamy and well blended. Pour into dry ingredients and stir with a whisk until just combined. Let the batter rest for 10-15 minutes. Meanwhile, spray skillet or griddle with non-stick spray and heat over medium heat. Using a ¼ cup measuring cup or ice cream scoop, pour batter onto the heated surface and cook until edges are dry and bubbles form in the batter. Turn pancakes and continue to cook until bottom side is golden brown. Remove to a plate and keep warm in a 250 degree oven until all of the pancakes are done and you are ready to enjoy. Serve with a dollop of Greek yogurt, banana slices (and/or berries) and chocolate shavings, and 100% maple syrup, or your favorite toppings. These fluffy oatmeal pancakes were my favorite. I loved the scalloped edges that were formed by the oatmeal in the batter and the vanilla flavor is super yummy with warm 100% organic maple syrup. Whisk flour, baking powder, sugar and salt in a medium bowl until well combined. In a separate bowl, whisk together wet ingredients. Pour into dry ingredients and stir with a whisk until just combined. Fold in oats with a spatula and let the batter rest for 10-15 minutes. 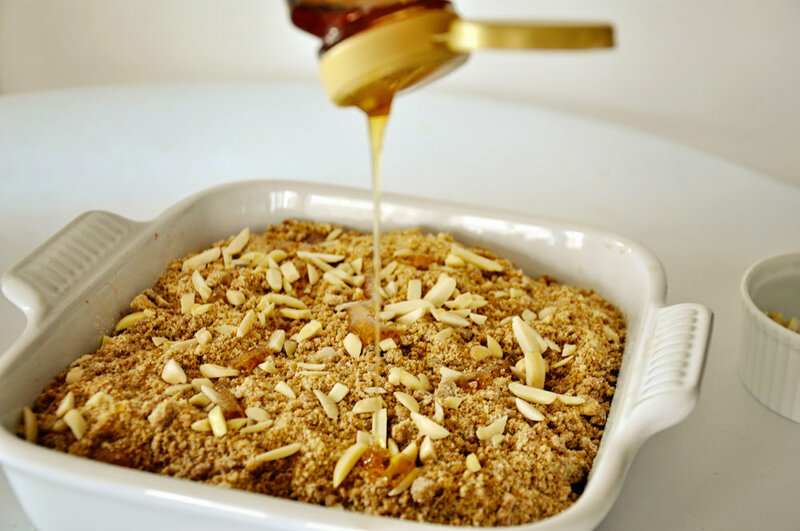 Gently stir to redistribute oats evenly in the batter just before cooking. Meanwhile, spray skillet or griddle with non-stick spray and heat over medium heat. Using a ¼ cup measuring cup or ice cream scoop, pour batter onto the heated surface and cook until edges are dry and bubbles form in the batter. Turn pancakes and continue to cook until bottom side is golden brown. Remove to a plate and keep warm in a 250 degree oven until all of the pancakes are done and you are ready to enjoy. 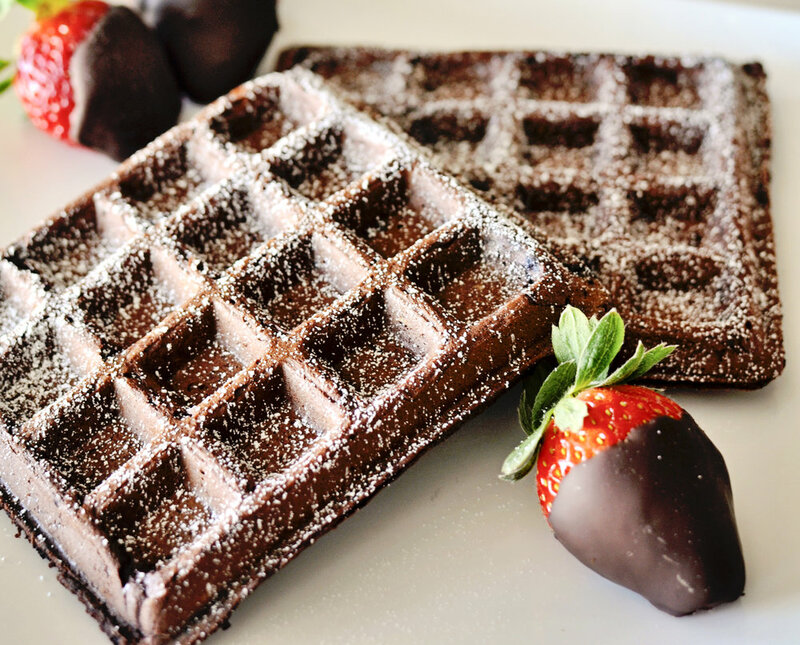 Serve with fresh fruit and 100% maple syrup, or your favorite toppings. 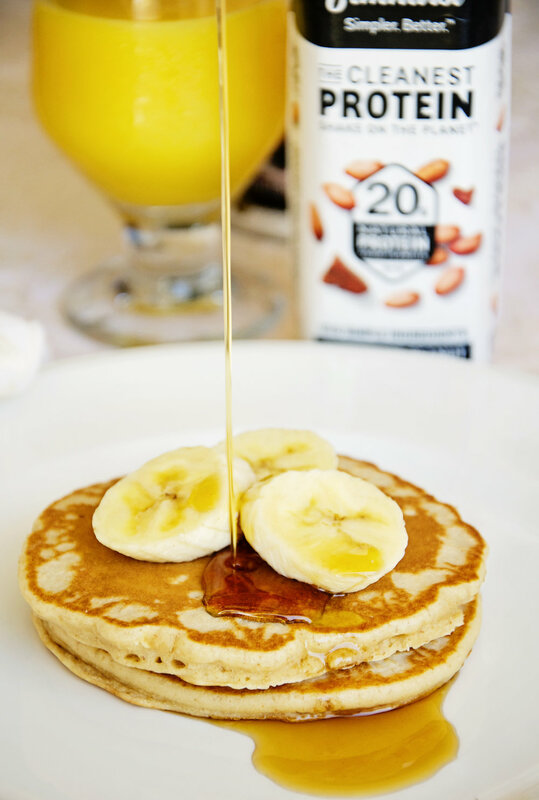 Enjoy adding these super protein packed pancakes to your morning routine, or for special weekend breakfasts with your family! Ah, the joys of spring, spring showers, spring flowers, spring vegetables, spring pollen, well maybe not that one, and spring cleaning. Spring symbolizes new life, and rejuvenation, our senses become alive again with the scents of spring and longer days allow us to spend more time enjoying evenings outdoors and al fresco dining. March is one of my favorite months of the year. I love the warmer temperatures during the day, but still cool enough for a sweater or jacket in the evening, and the occasional spring shower, that makes everything green, fresh and bright! There’s nothing like the fresh clean scent of a spring shower. Of course, for me, the newness of spring is all about the food. 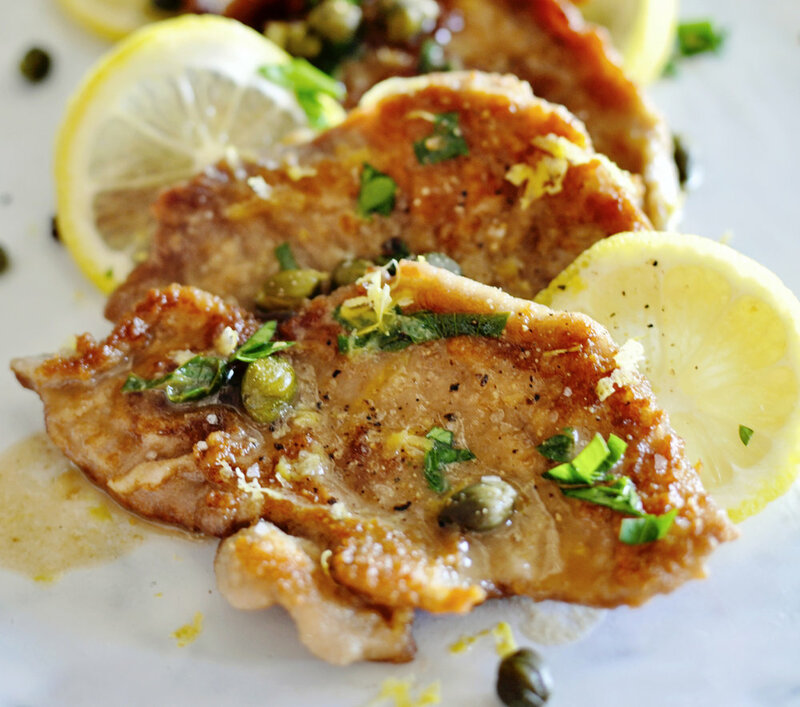 Spring is a great time to lighten things up with a more delicate fare after the hearty dishes of winter. I love cooking with fresh spring vegetables this time of year, sweet peas, carrots, brussel sprouts, asparagus, leeks, butter lettuces, fennel and arugula. 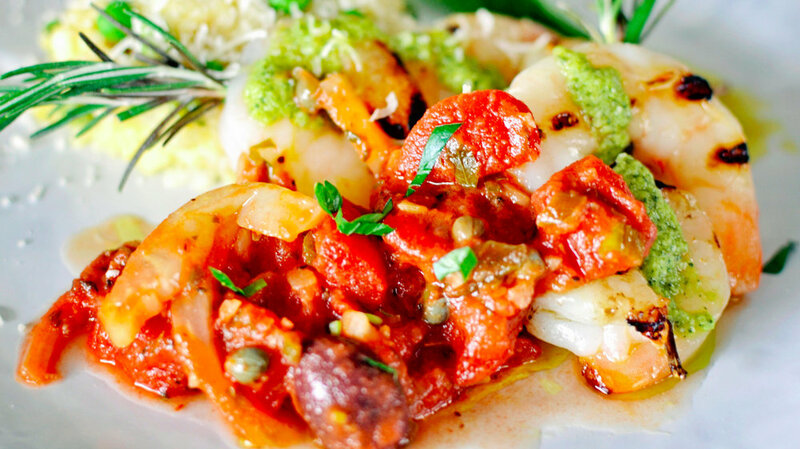 Fresh herb pestos are also a great way to add depth to lighter dishes with a fresh spring flavor. Spring is also a fun time to explore new lighter wine varietals after the hearty dishes and more robust wines of winter. 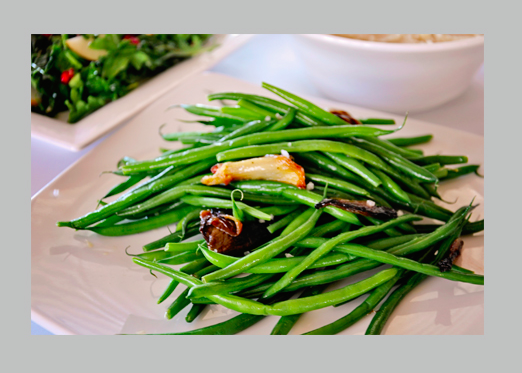 Spring salads, soups, entrées and wines feel somehow energizing and new. Here are some of my favorite spring wines paired with my fun & simple spring dishes like this month’s featured recipe on my Recipe Page, Spaghetti with Wilted Greens in a light and velvety sauce. This spring try a light Sauvignon Blanc, which is produced from a green skinned grape originally from the Bordeaux region (France) though now grown just about everywhere wine grapes are cultivated. 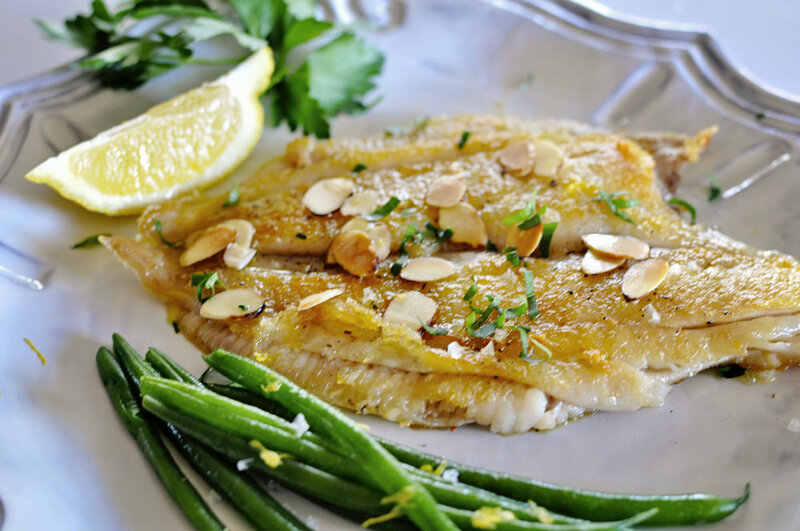 It produces a crisp, light bodied and fresh flavor, which makes for a perfect pairing with the fresh flavors of spring vegetables. In fact, a well-aged Sauvignon Blanc is said to develop aromas of spring vegetables like asparagus and peas as it ages. One of my favorites is Decoy Sonoma County Sauvignon Blanc from California. Another wonderful spring wine is Sancerre from the Loire River Valley. Sancerre is similar to Sauvignon Blanc, in fact it is a member of the Sauvignon Blanc family. Sancerre is produced in the Loire Valley, specifically the left bank of the Loire River. It’s medium bodied due to the minerals in the soil, yet delicate, floral and mildly acidic and pairs perfectly with goat cheeses, rich creamy bries, grilled fish, shellfish and chicken. Pan Seared Halibut with Risotto Primavera & Sweet Pea Pesto, a delightfully mild fish, pan seared to crispy on the outside, tender and juicy on the inside with creamy risotto and fresh pea pesto. 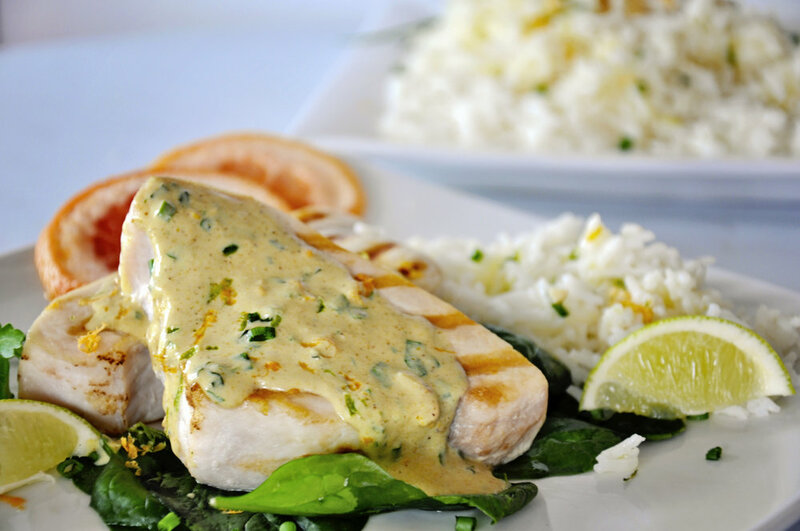 Perfectly paired with a Sancerre from the Loire River Valley with its floral mild acidity is a perfect balance with this mild and flaky fish, the complex flavors of the pesto and creaminess of the risotto. I’ve never met a Sancerre I didn’t thoroughly enjoy like the Domaine Fournier Les Belles Vignes. Shrimp Provencal, shown above served with angel hair pasta, with fresh grilled shrimp in a luscious Provencal sauce and sweet pea & basil pesto, pairs perfectly with the Sancerre, though the versatility of this dish also pairs nicely with a Rose’ from Provence or even a nice chilled Pinot Noir. Sweet Pea & Proscuitto Salad with Romaine, Butter Lettuce, Shaved Parmigiano & Proscuitto, a well rounded side salad to compliment any spring dish. Asparagus & Leek Soup, fresh, green, soothing and healthy! Paired with a crisp light Sauvignon Blanc. 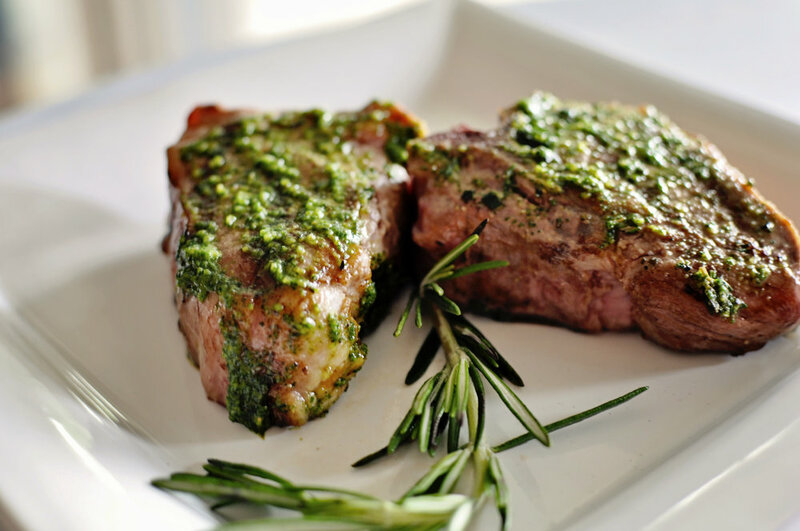 Grilled Lamb Chops with Mint/Basil Pesto, succulent lamb chops with a fresh minty pesto, paired perfectly with a nice California Cabernet Sauvignon-Merlot blend. The rich earthiness of the lamb balanced with the fresh pesto calls for a bold red wine that’s not too heavy. 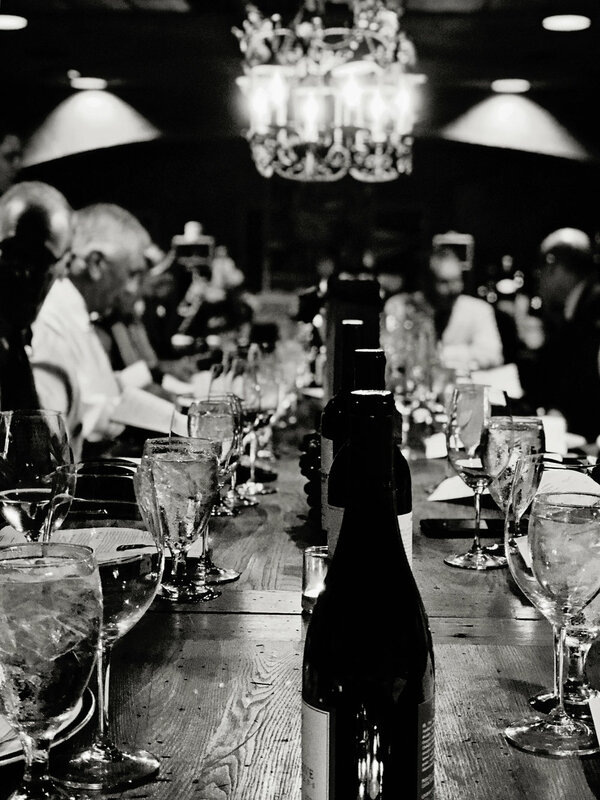 One of my favorite blends is the Duckhorn Napa Valley Cabernet Sauvignon. Rich and oaky yet perfectly balanced with the robustness of the Cabernet grape and lighter fruitiness of the Merlot. 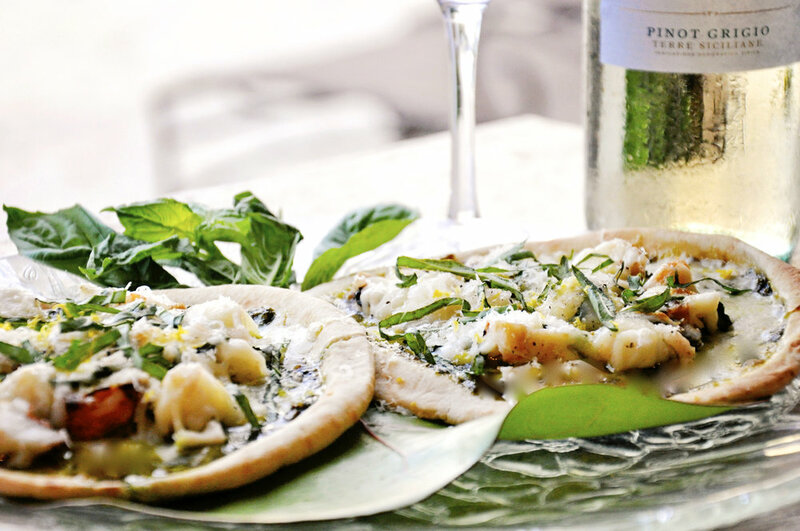 Enjoy these Spring Wine Pairings and Fresh Fun & Simple Spring Recipes! 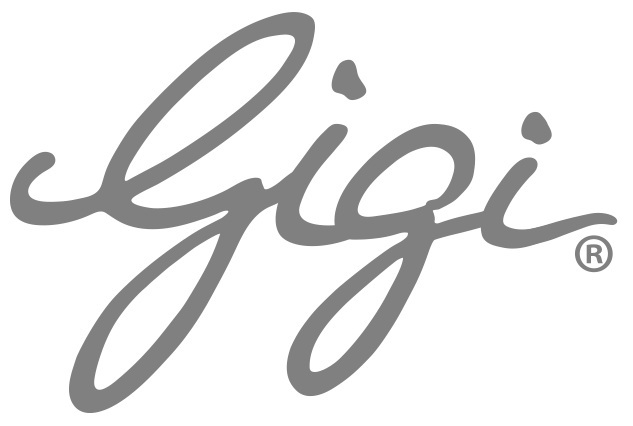 Remember to send me your photos of my dishes and tag them #gigistyle #funandsimple to be featured! If you haven’t already, don’t forget to download “Fun & Simple Gourmet” at iTunes (click here) for your Apple devices. You can also order your hard copy edition here or at Amazon.com! Wishing you all the joys of spring! Some of my favorite Wine Tools to help you enjoy exploring Spring Wines! Call me a hopeless romantic but my absolute favorite day of the year is Valentines Day. Champagne, chocolate, roses, and hundreds of renditions of my very favorite song playing all day…what could be better than that! Needless to say, we make it a day of culinary traditions. I like to set a fun, whimsical and romantic table to set the mood, then we start the day with strawberries and champagne and our traditional Valentine’s Breakfast, Chocolate Waffles! Super chocolatey, crispy on the outside, surprisingly light and spongy on the inside, with whipped mascarpone cream & pure maple syrup, a decadently delicious way to start the day! My favorite part of Valentine’s Day, besides the food of course…hundreds of renditions of "My Funny Valentine" (Rodgers & Hart circa 1937 from the musical Babes in Arms) playing throughout the day. 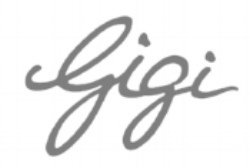 From Frank Sinatra to Chaka Khan, Ella Fitzgerald to Big Muff, Paul Brown jazz guitar, every genre of music imaginable! I know, silly right? I’m sure it makes Jeff crazy hearing the same song all day long, but believe it or not, each rendition sounds so incredibly different that it really doesn’t seem like the same song. Regardless, Jeff has put up with my Valentine’s Day shenanigans for 25+ years now, so he must not mind so much! Don’t forget to read to the end for recommendations of my favorite romantic places to celebrate with your Valentine. From New York City to Napa Valley, Charleston and the islands of the Bahamas, these destinations are the perfect getaways for two! About drinking champagne…the glass actually does matter! I love the Coupe, classic, nostalgic, elegant and romantic, but not good for bubbles if you are a big fan of keeping your bubbly, bubbly. The Flute is perfect for young Champagne and great for keeping the bubbles. The Tulip is my second fav…perfect for mature Champagne (aged to the point where it will not gain further complexity by continuing to store) and believe it or not a regular Wine Glass is ideal for high end more complex Champagne varieties. In addition to being festive and delicious, champagne also has some major health benefits, in moderation of course. Scientists say that drinking 3-4 glasses of champagne per week may actually help us live longer! Not only is it heart healthy, just as good as red wine, it improves circulation and may reduce the risks of cardiovascular disease. 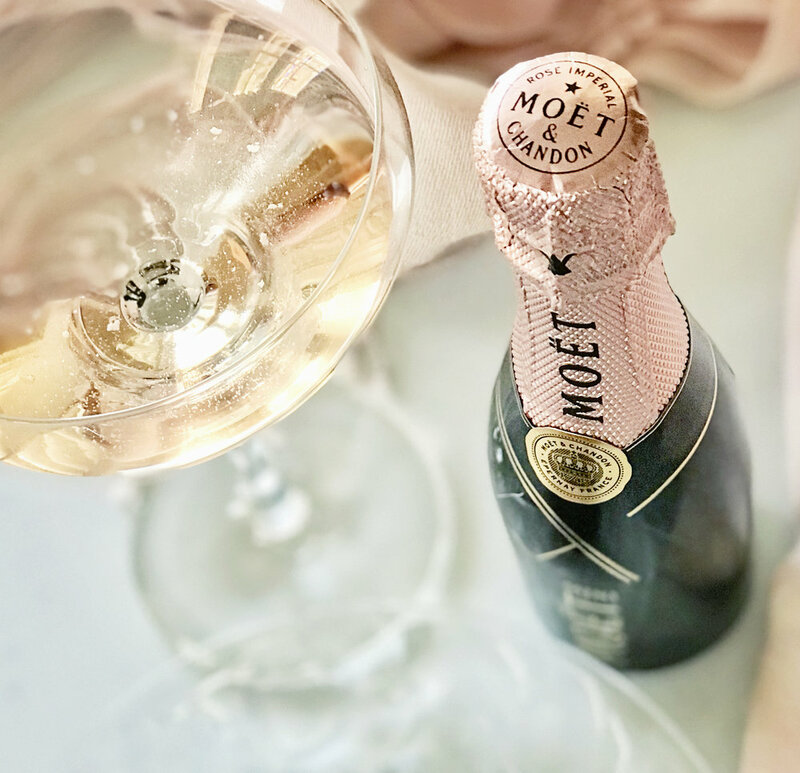 Champagne is low in calories compared to other wine varieties and according to a study at the University of Reading (and others) champagne can boost brain health and help prevent dementia and memory loss. Full of antioxidants, bubbles are great for your skin and skin tone. As if I needed another reason to love champagne! A perfect compliment to champagne on Valentine’s Day is my Lobster Cocktail, also delicious with fresh shrimp, and a wonderful beginning to a romantic Valentine’s Day dinner at home. So simple and can be prepared a day ahead of time, just put it together when you are ready to serve. 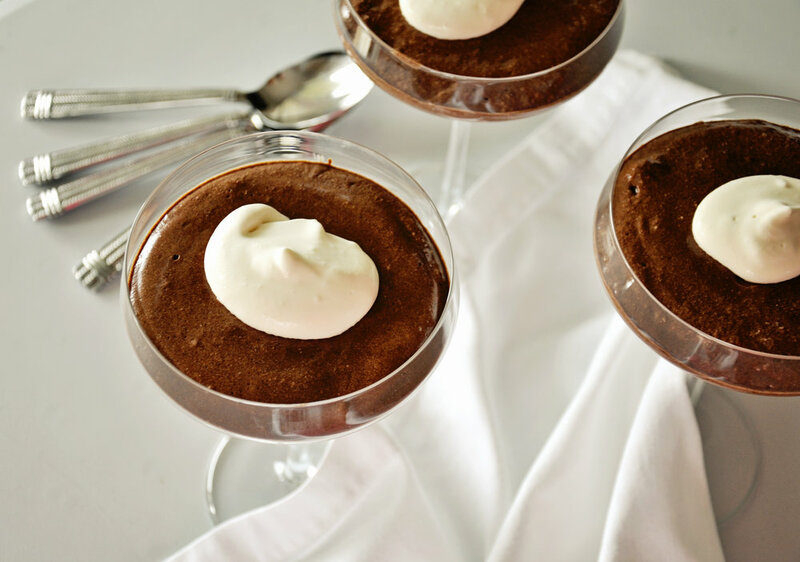 This simple, yet sophisticated and decadent appetizer could just as well be an elegant meal, served in a martini glass alongside a nice chilled glass of bubbly, I can’t think of a more beautiful way to start...or finish! You can boil the lobsters yourself, or have your fish monger steam them for you, making it even more simple to prepare. Four Seasons Ocean Club Bahamas - One of my favorite places in the world and definitely my favorite beach! 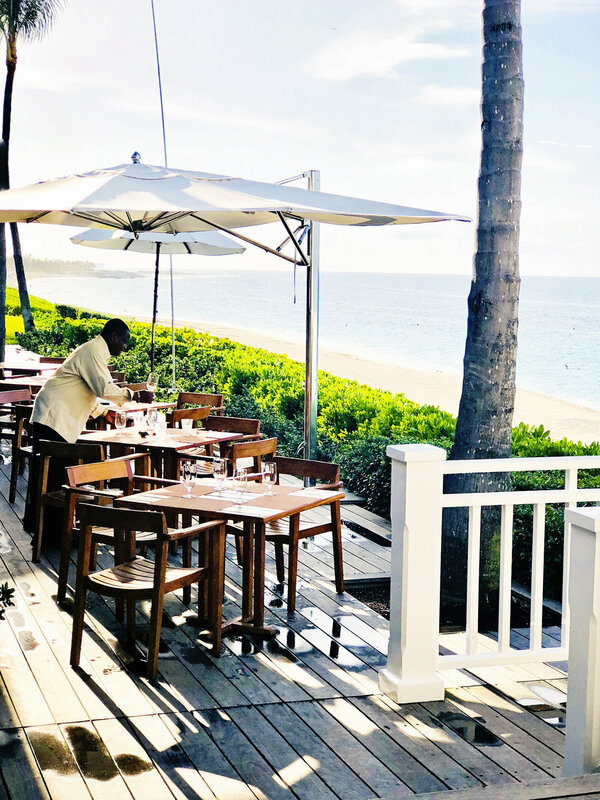 With Jean-Georges Vongerichten’s French-Asian cuisine with a hint of the islands, a delicious menu and what could be more romantic than oceanfront dining on the beautiful turquoise waters of the Bahamas? Meadowood Napa Valley - Nestled among the tall pines of the Napa Valley, this casually elegant gem is the ultimate of wine country romance. From the beautiful spa, croquet, golf, tennis and modern American cuisine at The Restaurant which sources from local artisans, growers and of course wineries, the Meadowood experience is like no other in Napa Valley. 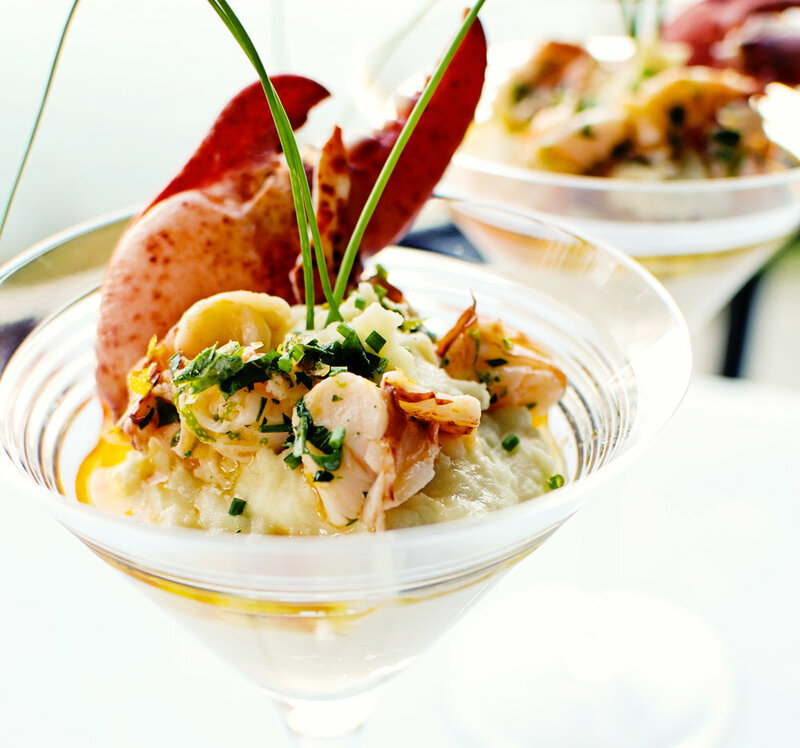 Chef Kostow calls his cuisine “evocative and playful,” what could be more romantic than that? The Surrey New York City - There isn’t a more romantic city than New York, and no more romantic spot than this favorite upper east side gem. Small and quaint, the bar is reminiscent of a lovers rendezvous next to the incomparable Cafe Boulud, cozy, intimate french cuisine by Chef Daniel Boulud, exquisite! Then, walk across the street after dinner for drinks and jazz at Bemelmans Bar at the Carlyle. Planters Inn Charleston, South Carolina - Located in the heart of historic downtown Charleston, the #1 tourist destination in America according to Conde’ Nast and Travel & Leisure, this Relais & Chateaux property exudes southern charm and romance. Have drinks in the candlelit Champagne Bar before dining in the velvet lined Peninsula Grill Dining Room and you must finish with the 12-layer Coconut Cake…simply divine to share with your Valentine! And, while you’re in Charleston, New York and Nassau, check out my Jeff’s historic walking tour app on your smartphone for a fabulous GPS guided self-walking tour of the city, complete with audio histories, local activities directory and directions. It’s beautifully done and so simple to use on your time, just the two of you. Check it out at historicwalkingtour.com. So, that’s it! My idea of the perfect Valentine’s Day either at home or away! Of course, it’s all about the food, lots of champagne and chocolate, all while enjoying Your Funny Valentine. 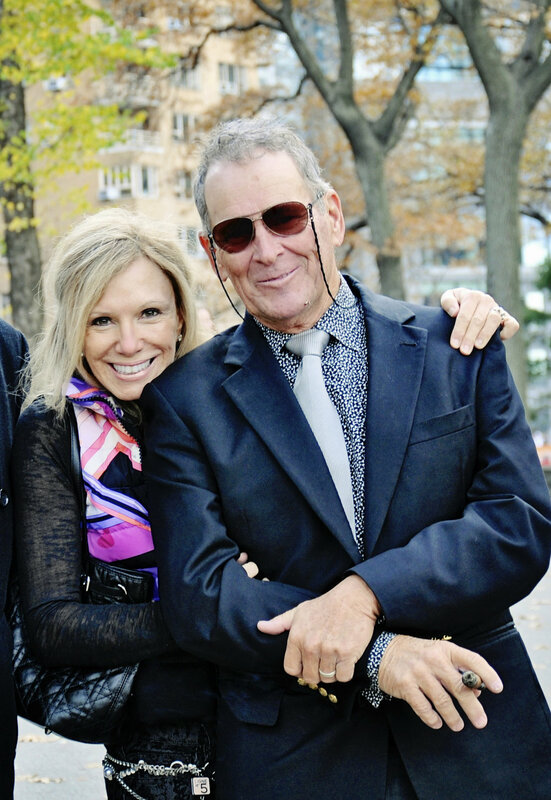 Me and My Funny Valentine! January is always a great month to reset and get a little organized with a fresh new start to a fresh new year. One of the best things you can do to enjoy cooking and being in your kitchen more is being organized. I am an organizational freak by nature, which comes in pretty handy, especially in the kitchen. People ask me all the time how I make entertaining look so easy and the answer is simply, by being organized. It doesn’t take that much extra time to plan in advance, in fact, in the end, planning and organizing saves time. January is also National Soup Month! What’s better than soothing, healthy soups to warm your soul. After the holidays, I’m always ready to hunker down at home, especially when the weather isn’t quite stellar. My Healthy Kale Minestrone is a hearty meal on its own. Packed full of fresh healthy veges, and finished with avocado and extra virgin olive oil, you will live on this one all winter long. I like to make a big pot on a Sunday, and then we have it to enjoy whenever we want, all week long. 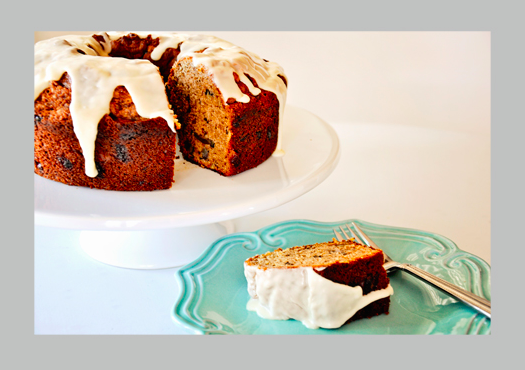 Just click on the photo for the recipe! 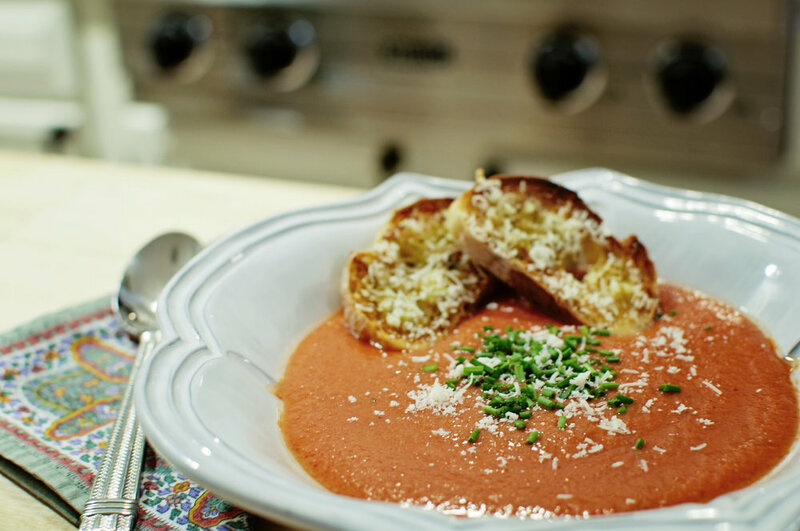 Keep scrolling for more healthy and delicious soups to keep you warm this month! Now back to organizing! Recently I did a little kitchen re-organization. My kitchen was in pretty good shape, but there’s always room for improvement. A few little changes can save a ton of time.One thing in particular was adding drawers to the inside of my base cabinets. Now rather than sitting on the floor to try to dig in the back of a cabinet to find something, I simply pull out the drawer and I can see everything that’s there and easily retrieve what I am looking for. This is especially helpful with heavy items, like my kitchen aide stand mixer. I also added drawers to my pantry shelves, making it super easy to find things, especially on the lower shelves. Which brings me to my next kitchen organizational peeve…expired foods. How many canned items are in your pantry that expired 2 years ago, 5…even more? It’s crazy to think about, but the time goes faster than you think. Take a few minutes even once a month before doing your grocery shopping to go through your pantry and refrigerator to remove expired items. It’s also a great way to make a good grocery list. If you stay on top of it, it only takes a minute or two. 1. Buy dried spices and herbs in small quantities and discard after 3 months. 2. Store garlic, shallots and onions in a bamboo steamer basket. It’s the perfect environment to optimum freshness and it helps keep the veggie bin in the refrigerator a little less cluttered. 3. Use drawer inserts for flatware, cooking tools and knife drawers to keep everything organized, easy to find and uncluttered. 4. Hanging pots and pans on a ceiling rack not only saves room in your cabinets, it makes them super easy to retrieve and put away. 5. Using an over the sink cutting board saves counter space and makes clean up so easy, just push the waste right into the sink. 6. I recently purchased an over the sink, roll up drying rack. So cool! Dishes, glasses and pots and pans drip dry right in the sink and when you are finished, it just rolls up and stores easily and without taking up much room under the sink. 7. Finally, labeling is a fun and simple way to keep everything organized. Some of my favorite organizational tools to help you get started! A few more of my fun and simple soup recipes! They are warm, soothing, healthy and delicious! Simply click on the photos for the recipes! Now, get in the kitchen, get organized, and make these wonderful healthy soups! 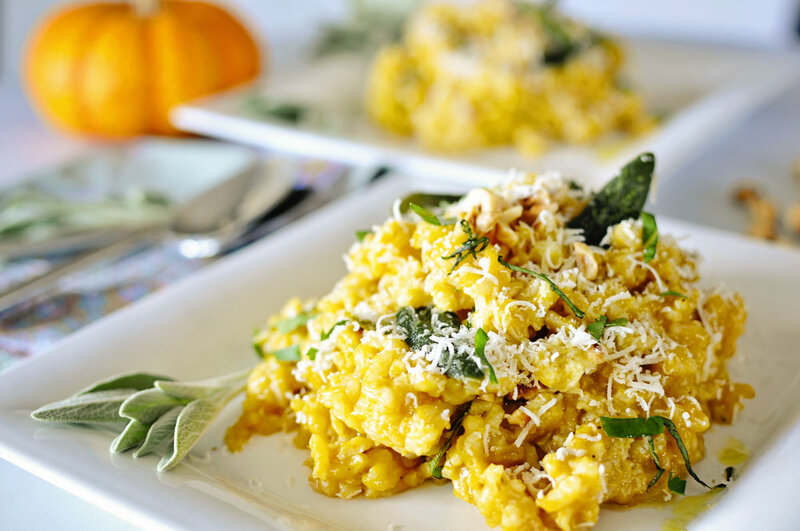 I hope you enjoy these healthy recipes as much as I enjoy sharing with you! You’ll find these and many more of my favorites in my latest lifestyle cookbook, “Fun & Simple Gourmet” at Amazon or iTunes for your devices! 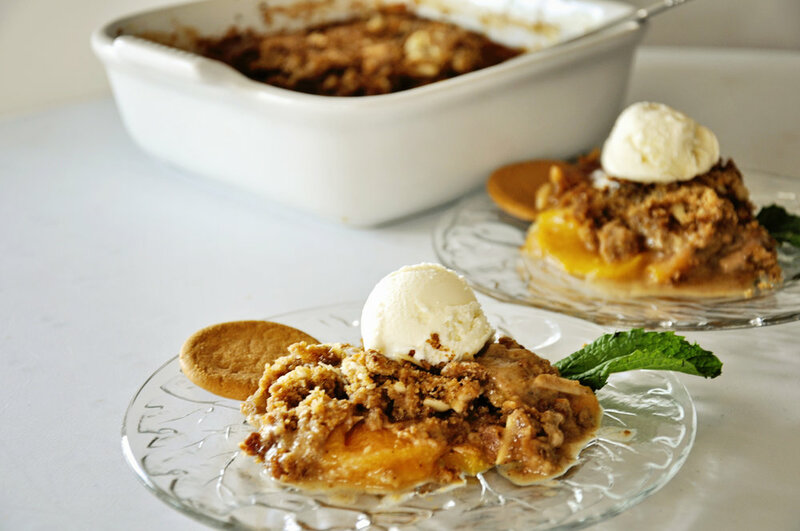 Just Peachy Recipes for National Eat A Peach Week! 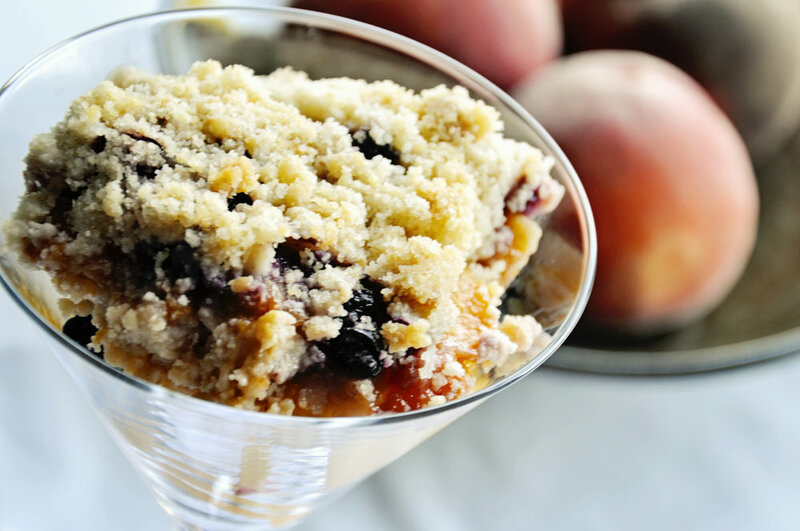 In honor of National Eat A Peach Day this week, I thought I would share some of my favorite sweet and savory peach dishes this week. I have had a wonderful summer in the kitchen creating new fun and simple recipes with all of the wonderful fresh summer fruits and vegetables, especially peaches. They have been so incredibly delicious this year, and I have had so much fun with my favorite stone fruit. From peach waffles to a rich and hearty Bolognese, fresh salads, appetizers and desserts, so many delicious options for enjoying fresh summer peaches while they last. 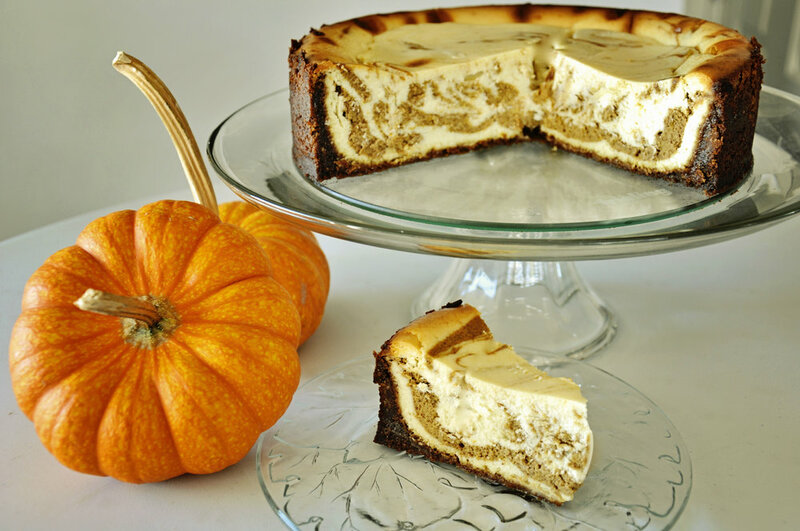 I am thrilled to share a few of my favorites with you to enjoy with your family. Don’t forget to share and send me your photos! You will find lots of my favorite recipes in my new lifestyle cookbook. Pre-order yours today! August marks the beginning of warm water lobster season in the waters of south Florida and the Caribbean. I am a bit partial to warm water lobster, which are known for their lighter flavor and tender meat, as compared to cold water lobster. Also found in the waters of the Mediterranean and Asia, warm water, or “spiny lobster” have a long tail and head similar to that of their cold water distant cousins, but they do not have claws, rather long spiny antennae. I say distant because although both varieties are crustaceans, they are actually from different species and families. 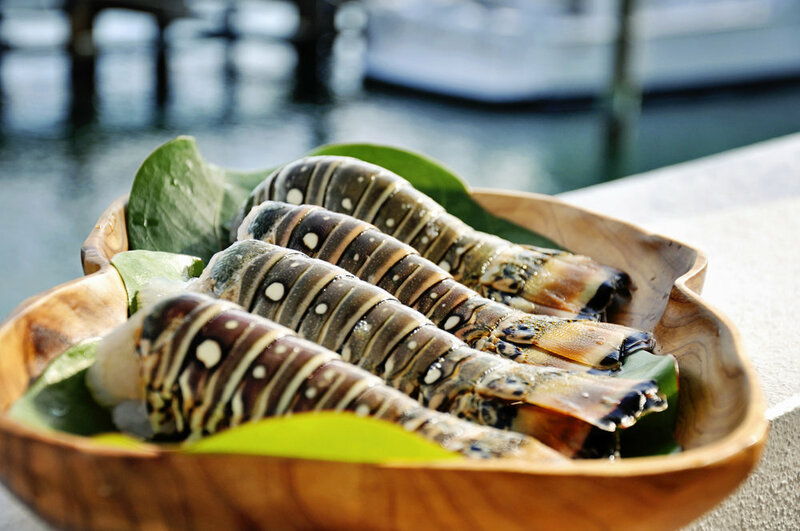 The only edible meat of the spiny lobster is in its tail, tender, juicy and very sweet. That being said, there is something very special about the claw meat of a cold water lobster, but my heart belongs to the mild and tender meat of the warm water lobster tail. Though cold water lobsters are harvested year round off the northern coastline of the United States and Nova Scotia, summer is considered lobster season. Warm water lobster season is August 1 – March 31, giving time in the spring for mating season and reproduction. We have wintered in Nassau, Bahamas for over 20 years and consume a lot of lobster while we are there! It is fresh, abundant and is so simple to be prepared and in so many ways! I serve lobster for breakfast, lunch and dinner, in appetizers and salads, and our continuous flow of house guests are always excited about which dishes they will experience during their visit. Here are some of my favorites! Simply click on the photos for the recipes! My new lifestyle cookbook, Fun & Simple Gourmet, is launching September 1st! 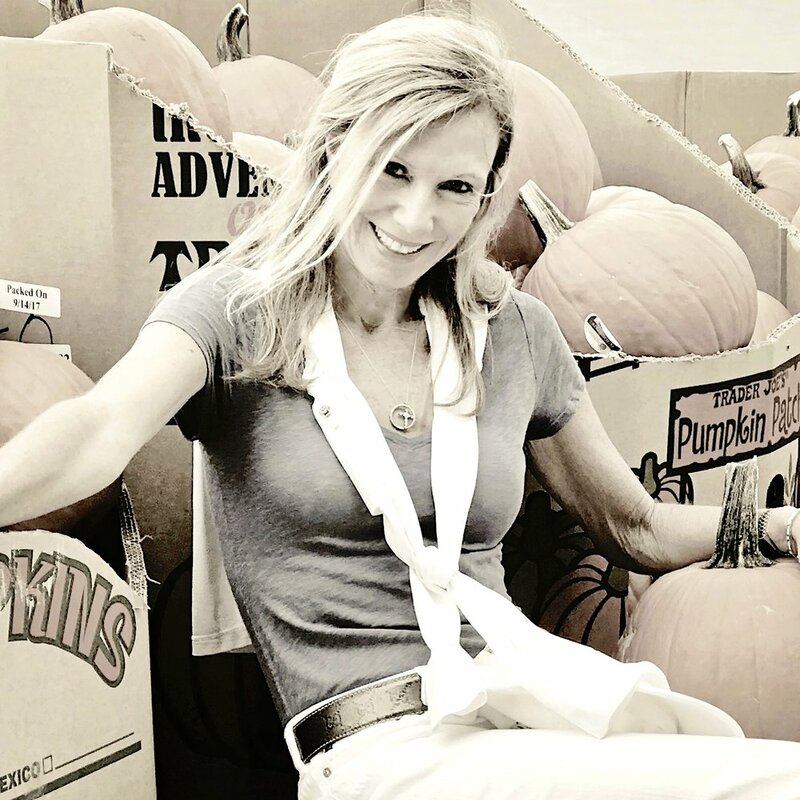 Filled with my favorite fun and simple recipes for your healthy gourmet lifestyle! Don't forget to Pre-Order your copy today! 5 Great Recipes for a Delicious 4th of July! Independence Day has always been my favorite summer holiday, maybe because it always includes two of my favorite things, fireworks and red velvet cupcakes! On Independence Day we celebrate the anniversary of our Declaration of Independence from the British Empire with parades, fireworks and yes, food! You will love all of my fun and simple recipes to help plan your 4th of July holiday menu, but first, a little history. The Declaration of Independence was finally approved and signed July 4, 1776, officially declaring the United States of America independent from Great Britain. Ironically, John Adams died on July 4, 1826, the 50th anniversary of the Declaration, as well as Thomas Jefferson who also passed on this very same day. The two were also coincidentally the only signers of the Declaration of Independence to become United States Presidents. These rich and super moist cupcakes are the perfect 4th of July Grand Finale! 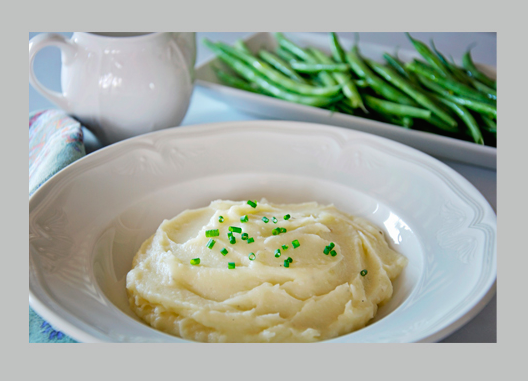 Here are a few more fun and simple dishes on our holiday menu this year! Simply click on the photos for the recipes...enjoy! Don't forget to send me your food pics from your holiday table! 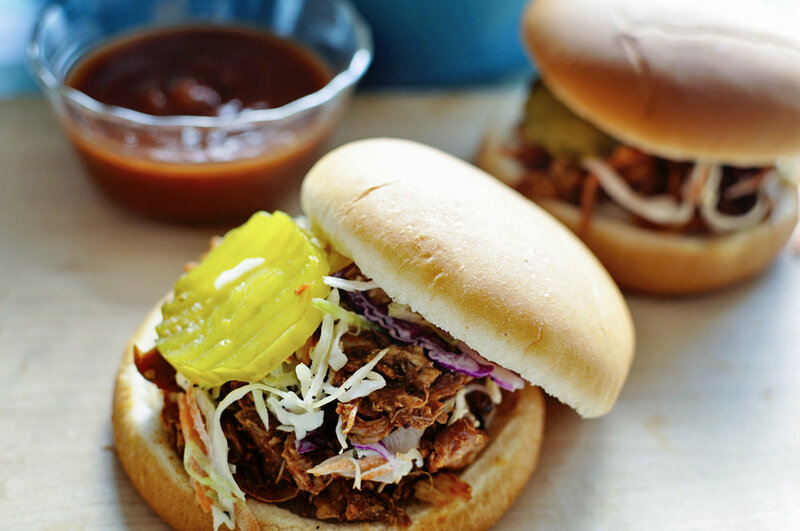 I know I said 5 great recipes for your delicious 4th...I couldn't help but share a couple more! We are celebrating right here at home this year...Hilton Head is such a great place for the 4th! Where are you spending your holiday? Send me your 4th of July photos, including your holiday table! I would love to share...and feel free to share these recipes and menu ideas! One of the biggest food trends this year has been non-dairy milk alternatives, mostly plant based nut milks. Replacing dairy is a great way to enhance your healthy lifestyle! 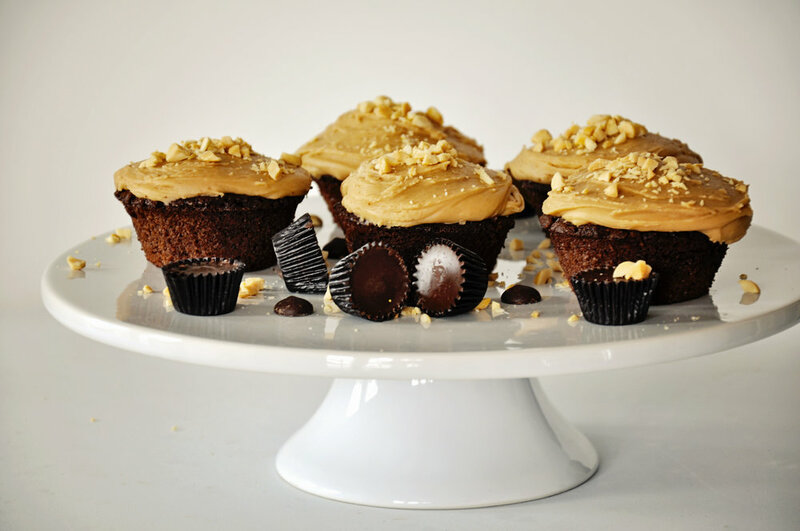 This week's blog includes several fantastic and delicious recipes using peanut milk, both plain and chocolate, from protein packed breakfast muffins, to light and healthy pasta, warm soothing fish curry and decadent desserts, like these gorgeous Peanut Butter Cup Chocolate Cupcakes! In addition to being high in protein, other incredible health benefits associated with peanuts include biotin, an enzyme healthy B vitamin, heart healthy monounsaturated fats which lower stroke and heart attack risk, antioxidants that neutralize free radicals and reduce cancer risk and consuming peanuts may even protect you from gallstones! You've seen them all, almond milk, cashew, walnut, even hazelnut milk, but this is the first Peanut Milk, introduced by Elmhurst 1925. (@elmhurst1925) Peanut milk is dairy-free, non-GMO, vegan, lactose free and Kosher. With today's trends in food, turning to a more plant based protein diet, as a replacement for dairy products, nut milks have become a viable and popular alternative. In addition to their already produced almond, hazelnut, cashew, walnut and grain milks (oatmeal & brown rice), Elmhurst (@elmhurst1925) has developed the first peanut milk (regular and chocolate!) and it is delicious! It's spring in Kentucky and the first Saturday in May is all about the Run for the Roses! Who will wear the coveted Garland of Roses this year? A tradition that started in 1896 when the Derby winner was awarded a floral arrangement of white and pink roses. The red rose became the official flower of the Kentucky Derby in 1904. Garland of Red Roses, more than 400 red roses and a crown, one single rose in the center to recognize the heart required to win this incredible race. Derby Pie, my favorite Kentucky Derby Tradition...well, except for a cool Mint Julep of course! Check out my recipe for Kentucky Derby Pie! It is rich, chocolaty and delicious, a perfect compliment to a sweet and minty julep! Give it a try and send me your thoughts! 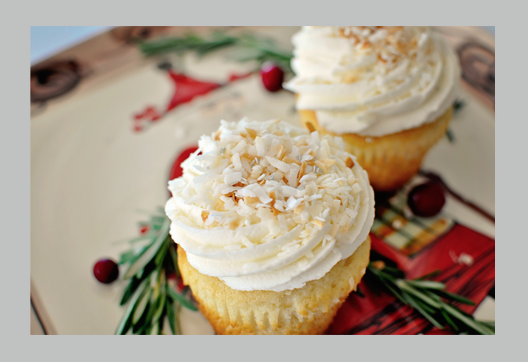 Holiday Entertaining Tips ~ Fun & Simple Style! 1. Casual Elegance is always my motif. It’s easy, comfortable but still lovely and beautiful. I want my guests to feel relaxed and content but also special. I like an eclectic combination of casual and formal, all on the same table, makes it fun and festive without being over stuffy. 2. Select a theme or color. Choosing a theme and/or color helps make everything else come together with ease. Of course, the holidays make it super easy because the main theme is already set. Then it’s down to selecting a color combination. Make it simple and use table top accessories you already have, just make them a little festive. Red, green, silver, gold, all fantastic holiday colors, and there is nothing wrong with simple white napkins, rolled and tied with a pretty gold holiday ribbon. 3. Welcome Guests with a Special Greeting. Set the tone with a simple glass of champagne with a rosemary stalk or my festive Holiday Bellini, blood orange, Prosecco and Grand Marnier, that will get your guests in a celebration mood! 4. Celebrate the Season. Focus on flowers or greenery for the table that exude the holidays. Fresh herbs like rosemary stalks and fresh cranberries are a great way to decorate the table. 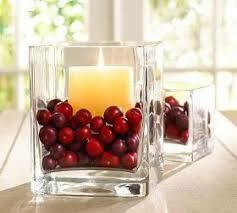 I like using all white candles in hurricanes with fresh cranberries and rosemary around the candles. 5. Fun Place Cards. Wine corks make great place card holders. Using a serrated knife, simply cut a ¼ inch slit into the top of the cork and slide the place card into the slit. I sometimes even use the wine corks as the place card by writing the names on the cork with a Sharpie! Champagne corks are fun place card holders, especially for holiday entertaining! Another fun and festive place card is a simple candy cane. Punch a hole in your place card, and tie around a candy cane with holiday ribbon. 6. Fun Water Service. How simple is just adding festive fruit or herbs to your water pitcher or water glasses, it doesn’t take a lot of effort, to make it extra special. For the holidays I like serving water with apple slices and cinnamon sticks or orange slices with cranberries and sage leaves, even lemon slices with rosemary sprigs, all add flavor and festive décor. 7. Little Gifts. 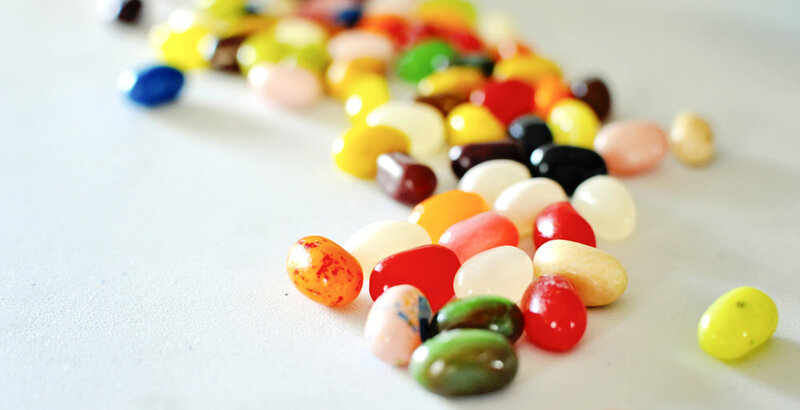 I like to send a little gift home with everyone, even if it is just a simple chocolate holiday candy, a little bag of your Christmas cookies, even a candy cane with a pretty ribbon tied around it or a mini-bottle of their favorite cordial or liqueur. 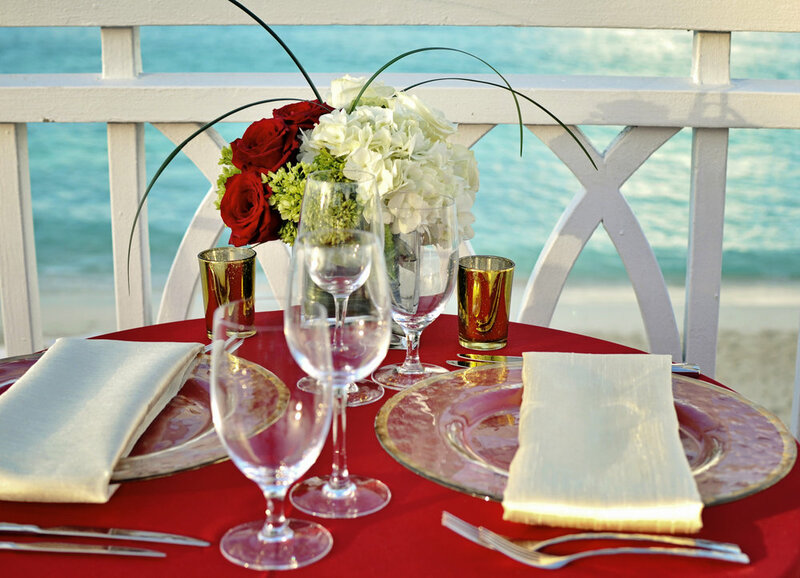 A little something makes a lovely lasting impression. 8. Lastly and Most Importantly! Do as much as you can in advance! 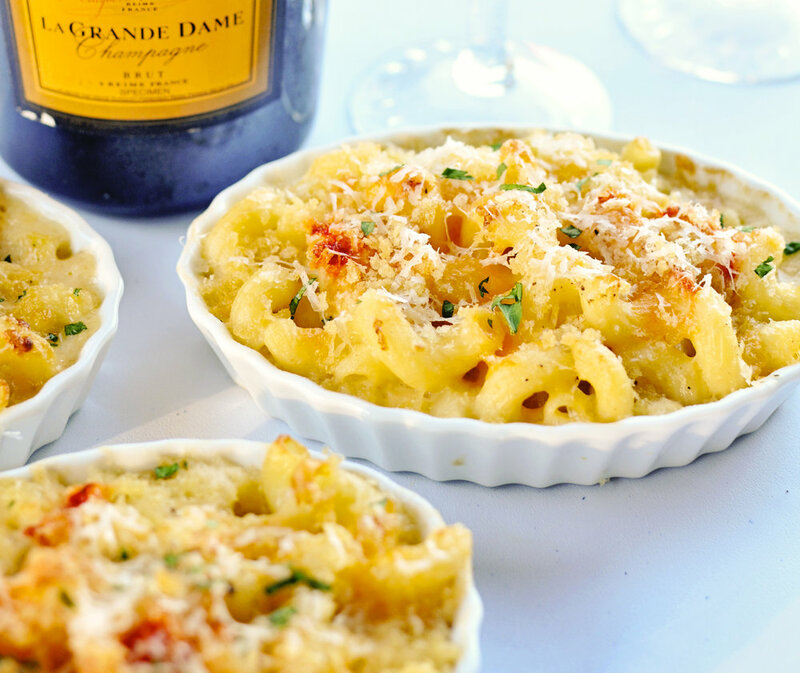 This simple task makes holiday entertaining so much easier! Entertaining is supposed to be fun for everyone, especially the host! You can do things like setting the table a few days in advance and a little prep every day really adds up to saving time and stress! Also, it is really not necessary to have several side dishes or desserts. One of my favorite lines, that I use a lot is, "more isn't always better, it's just more!" 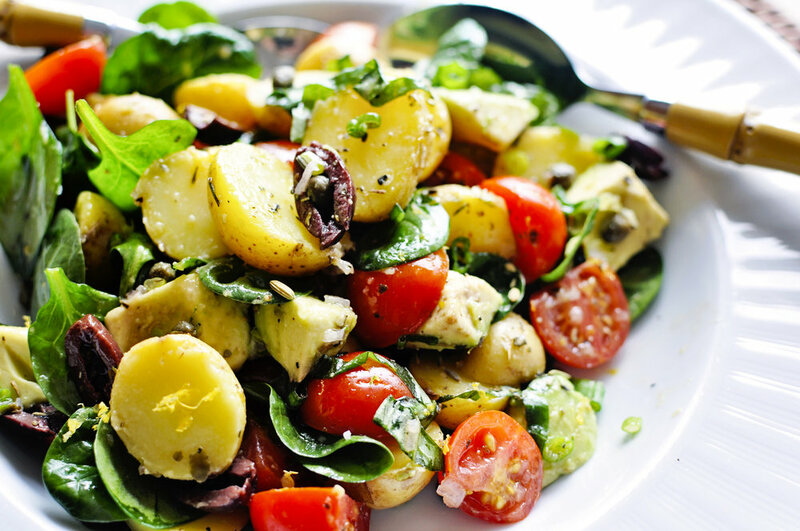 Pick your favorite salad, potato or starch, and one vegetable that compliment your main dish, and stick with those. And don’t be afraid to let your guests help! It’s fun to cook together, and if they offer to bring something, let them! 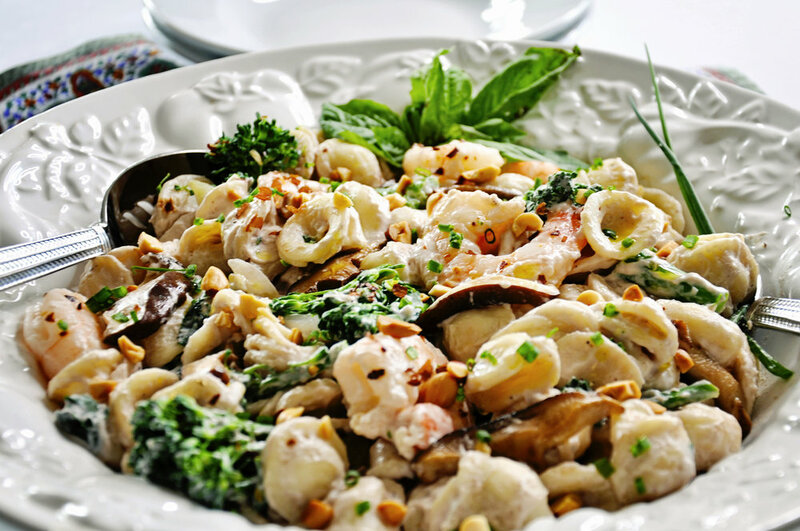 An appetizer, bottle of wine, even a side dish or dessert, it just makes the main event even easier on you! These are my sides this holiday to be served with my Porc Aux Figues for Christmas Dinner! Enjoy this holiday season and have fun entertaining your family and friends! Wishing you the happiest of holidays and a most wonderful year ahead! Cheers! Merry Christmas from 21 Club NYC! The Pineapple Fountain represents the true meaning of the crowned fruit, Welcome, Friendship and Hospitality, the very essence of this fantastic city. There is a reason why Charleston is voted #1 in North America and #2 in the world by Conde' Nast Traveler and Travel & Leisure, it's rich history, natural beauty, amazing culinary and southern hospitality, make it not just a world class summer vacation destination, but a fantastic getaway any time of year! Charleston is much more than cobblestone streets and classical architecture, it has become the culinary capital of the southeast, in this city, "History Reigns, Food Rules!" There are over 200 restaurants in this beautiful city, offering everything from slow cooked traditional southern food and barbecue, to farm to table and fine dining, including several James Beard award winners. Award winning Sean Brock's Husk and it's sister restaurant, McCrady's, members of the Neighborhood Restaurant Group and two of my favorites. Husk, Bon Appetit's 2011 Best New Restaurant in America, features a modern take on farm to table southern food whose menu changes daily based on the fresh ingredients of the day. McCrady's set in a 4-story Georgian House, circa 1778, home of Edward McGrady, which he opened as McCrady's Tavern, has been many things since his death in 1802, but today stands as both a tavern and adjacent haute cuisine multi-course tasting room. Another favorite is the Hall Family's Hall's Chophouse. Jeannie and Bill Hall opening Hall's in 2009 joined by sons, Tommy and Billy, this family has spent all of their lives in the hospitality industry. A true neighborhood hot spot offering a well rounded menu for all palette's, live music and the best Gospel Sunday Brunch in town! In fact, Jeff and I went for brunch once and stayed through dinner enjoying gospel and jazz all afternoon long! And, by the way, we were among several other tables who did the same thing! Did I mention shopping? A day on King Street is a shopping extravaganza! From fine art and antiques to designer boutiques, book stores, home decor, chocolates, cosmetics and coffee shops, King Street is Charleston at it's best. Rainy day of shopping on King Street! Hotels range from Belmond's Charleston Place, to lovely and quaint B&B's and guest houses. There is truly something for everyone in Charleston. Whether you are a foodie, shopper or history buff, Charleston has it all. Check out Jeff's historic walking audio tour of the city at historicwalkingtour.com! 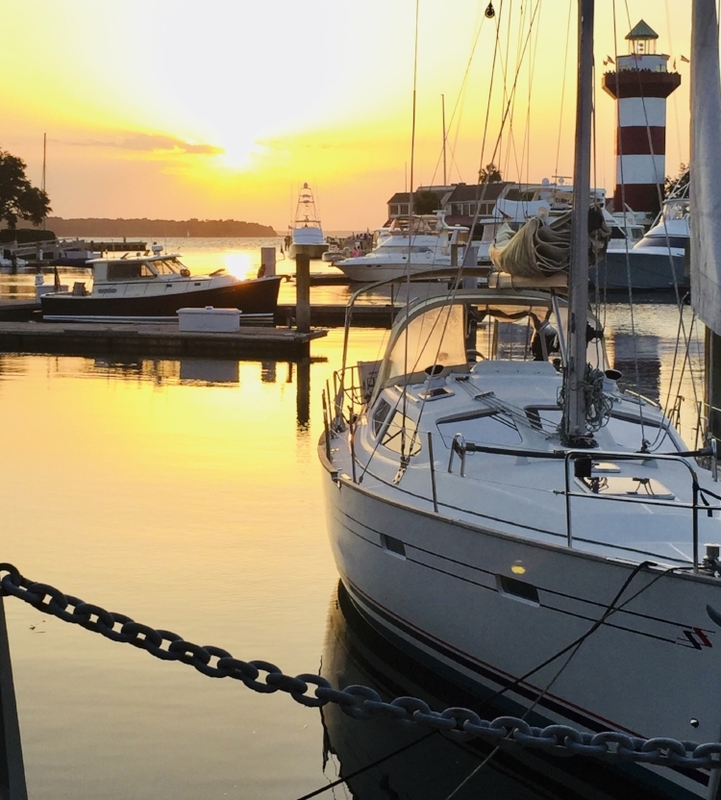 I hope you can add Charleston to your summer travel planning! You will be glad you did! Send me your photos and favorite places! Happy July! Summer Travel Series - Celebrating the 4th of July! Fireworks in historic Boston Harbor. Founded in the 1600's and where the American Revolution began, what a perfect 4th of July vacation destination! While you are there, check out Jeff's audio historic walking tour with 50 historic sites on a beautiful walk through the city. Click here to view the tour! Where are your summer travels taking you? The Declaration of Independence was finally approved and signed July 4, 1776, officially declaring the United States of America independent from Great Britain. Ironically, John Adams died on July 4, 1826, the 50th anniversary of the Declaration, as well as Thomas Jefferson who also passed on this very same day. The two were also coincidentally the only signers of the Declaration of Independence to become United States Presidents. Celebrating right here at home...Hilton Head is a great place for the 4th! 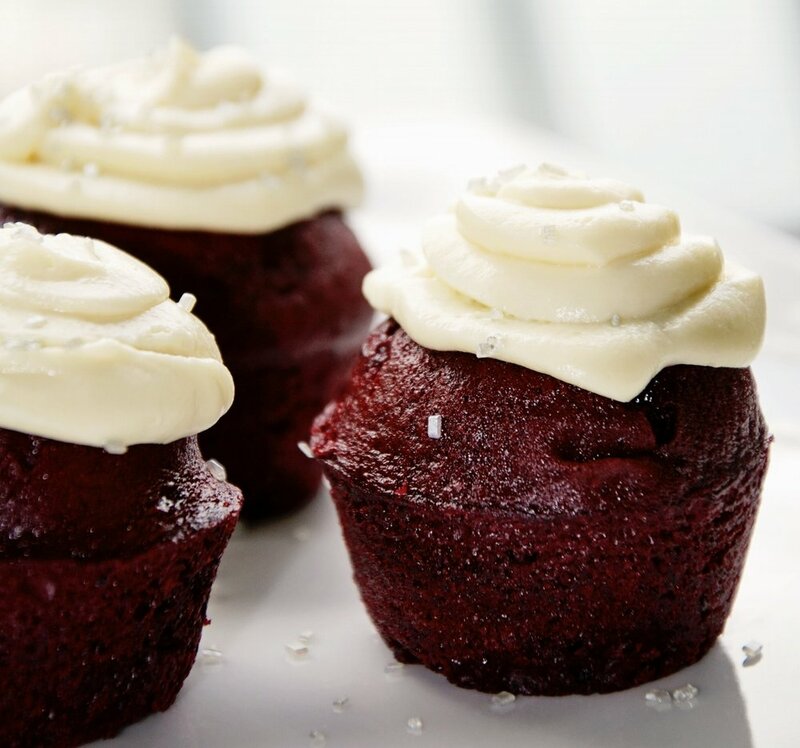 A 4th of July tradition...whatever the holiday menu...always ends with my scrumptious Red Velvet Cupcakes with creamy mascarpone and cream cheese frosting, my favorite part of the holiday! My Red Velvet Cupcakes...Click Here for Recipe! The best part about celebrating holidays is that the festivities always revolve around family, friends and food! Though my favorite part of the 4th of July is the cupcakes, the fireworks are a close second! It's Summer! Have Suitcase...Will Travel!!! Summer is here... Some say finally...I say already? But ready or not, it is upon us, summer! It is time to start thinking about summer travel planning. I hope our summer travel series leads you to a great summer trip, destination, restaurant or even just a new fun recipe. I want to hear from you! Please send me your summer travel questions and your feedback! If you choose one of our recommendations, send me your photos, I'd love to post to the blog! Wishing you a safe, happy and healthy summer! Bon Voyage! Practice makes perfect as they say, and after many years of doing it, I pretty much have it down to an art. Summer vacation travel is exciting, but seems to bring with it an added level of stress by nature. Summer travel is meant to be fun…so let’s see what we can do to help keep it that way! First make a packing list of the types of items you will need, depending on your destination and planned activities. Packing smart is the key to stress free travel. Pack light! Lighter weight summer clothing makes this even easier. Choose knits and cottons, fabrics that don’t wrinkle easily. I can actually go for two weeks in a carry-on bag, I know what you are thinking, impossible right? Stick with me here. Pick a color and plan around it using the Rule of Three. No more than three bottoms and/or 3 tops that are interchangeable among each other, this is where your color selection comes in, plus it really makes choosing what to take so much easier! Pack layers and ladies don’t forget a little black dress, the most versatile item in your closet. Dark fabrics don’t show stains and can be worn more often. If you roll clothes, place those items on the bottom of your bag and folded items on top. Pack small light colored clothes and undergarments in Ziploc bags, squeezing all the excess air out. Think what you can do without, and don’t pack it! Only take jewelry that you are actually wearing to travel, which not only keeps is simple, but also helps to prevent leaving a “little” something behind. Shoes: Rule of Three. Pack one pair of dress shoes and one pair of casual shoes, and of course, if you plan to visit the gym or hit the tennis courts, one pair of tennis/workout shoes. Of course, you will be wearing one of these for travel, so you really only need to “pack” two. Stuff shoes with sunglasses, charge cords, other smaller items that will fit inside. If you are taking your golf clubs, don’t forget to utilize extra space in your golf travel bag for items that would take up unnecessary space in your suitcase, shoes in particular, tennis rackets, etc. Pack liquids and cosmetics in small travel containers and place in sealed Ziploc bags, which helps with organization and prevents leakage. Place vitamins and supplements in Ziploc bags avoiding bottle bulk. There you have it. Stress free travel…just in time for your summer vacation! Check out this video featuring all of the many wonderful activities at Sea Pines Resort! Don't forget to pack the camera! Okay, iPhone 7 with Portrait Photography feature! JT and me enjoying the Ocean Lounge, Sea Pines Resort, Hilton Head Island. 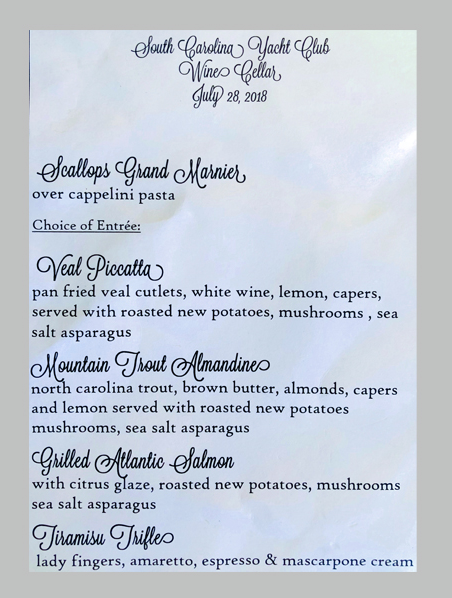 If you haven’t made summer travel plans as yet and you are still looking for a fabulous destination for you and your family to spend time together in an amazing setting with incredible culinary…my summer dish list recommendation – Sea Pines Resort, Hilton Head Island. The best family vacation spot in the world! Happy Traveling! And if you are in my neighborhood, please reach out! Preparing your home: Turn off toilets, or water altogether. Pour a little bleach in the toilets. Turn off the icemaker and remove the all but a couple of ice cubes. This way you will know if you had a loss of power while you are away. Chances are if the cubes have melted, the food in your freezer has also thawed at some point. Remove foods and condiments from the refrigerator that will be spoiled by the time you return. Leave closet doors ajar for air circulation and in summer or warmer climates, leave AC turned on to 78-80 (F) degrees. If you are traveling by air, ladies, always carry a wrap or sweater on the plane. And children should pack (with supervision of course) and carry their own bag! I see some of the cutest roller bags being pulled by the most proud children when I’m traveling. Traditional Low Country Boil. Fresh local South Carolina Shrimp, Smoked Kielbasa, Red New Potatoes and Fresh Corn on the Cob. Click here for recipe!